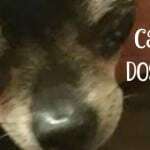 This post is sponsored by Bayer® ExpertCare™ and the BlogPaws Influencer Network. 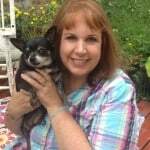 I am being compensated for helping spread the word about Bayer ExpertCare products but I Love My Chi only shares information we feel is relevant to our readers. Bayer ExpertCare is not responsible for the content of this article. Did you know that I’m a certified dog groomer? Yep, went to school for it and everything. Although I haven’t groomed professionally in years, I still put those skills into practice when it comes to bathing my own 3 dogs. Those of us with Chihuahuas have it pretty easy. I’d much rather bathe my 6 pound Kilo than my 80 pound Buddy. The basics are the same for all dogs though. Get everything together (towels, shampoo, etc.) before you start bathing. There’s nothing more annoying than having a wet dog in the sink and realizing you forgot to get a towel. The supplies needed: shampoo, conditioner (optional), cotton balls, wash cloth, ear cleaner, 2 towels, apron for you, brush (for long haired dogs), pitcher if needed for pouring, and nail clippers. For a long haired Chi, brush him first to get any mats out. 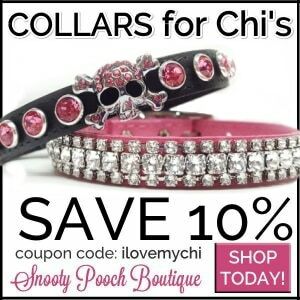 Put a small amount of cotton in your Chi’s ears. I clip Kilo’s nails first. I figure since I’m already doing something she doesn’t like, I might as well get it all done in one shot. Run the water until it’s warm. Test the water on your wrist to make sure it’s not too hot or cold and put your dog in the sink. With the pitcher or sprayer, wet your dog all over, except for his face. Do use a shampoo specially made for dogs. People shampoo is PH balanced for people, not dogs.Dog shampoo is PH balanced for dogs. 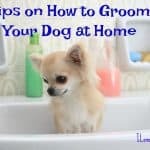 A groomers trick is to squeeze about a tablespoon of shampoo into a small, clean squeeze bottle (an empty dish detergent bottle will do) and fill the rest of the bottle with warm water. Shake the bottle to mix the shampoo and water up. Squirt your dog with the shampoo/water mixture from the neck down and lather your dog up. Be sure to lather the underside of your dog, along with her legs, armpits, tail, chest, etc. During this time, I like to massage Kilo’s skin while lathering. It feels good to her and if you are using a moisturizing or medicated shampoo, the massaging helps it to work better. Rinse your dog completely until the water runs clear. Start from the neck and back, and then rinse the rest of the body. If using a conditioner, apply this now. Again as with the shampoo, work from the neck down and skip the face. Let the conditioner sit on your dog for about 5 minutes. While you are waiting for the conditioner to do it’s stuff, you can work on the face. Take your wash cloth, wet it with warm water and apply a small amount of the shampoo mixture to it. 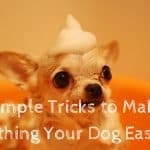 Use the washcloth to lightly clean your dog’s head and face. Be careful around the eyes and don’t forget under the chin and behind the ears. Rinse out your washcloth until the shampoo is all out and wipe your dog’s face again, getting all the shampoo off the skin. Take out the cotton balls in your dog’s ears and clean them with ear cleaner according to the cleaner’s instructions. Rinse all the conditioner off of your dog’s body and let all the water drain out of the sink. Squeeze the excess water out of your dog’s fur with your hands. While doing this you can feel around to make sure you got all the shampoo and conditioner out of the fur. Towel dry your dog with one of the towels. When the towel is wet, switch to the other towel. If your dog has long hair, then brush him again after he is dry. 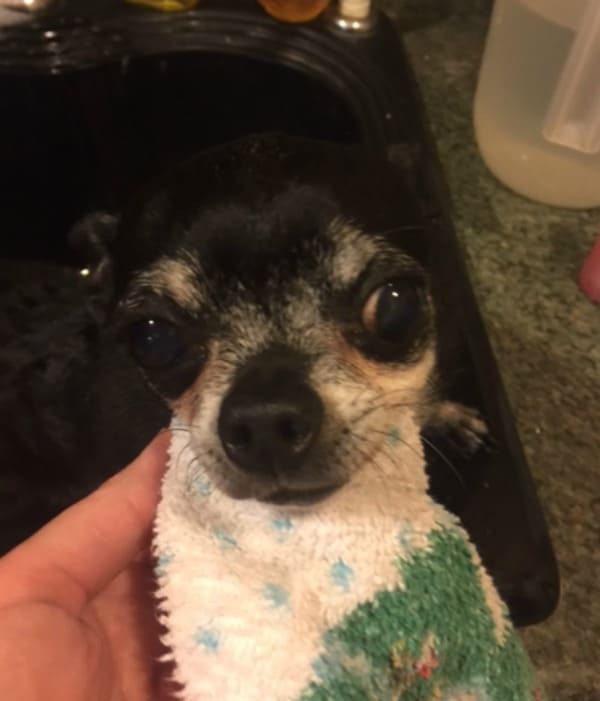 Now you have a clean Chihuahua! This may sound like a long and involved process but actually it only takes 10-15 minutes. I only bathe my dogs about every 3 weeks and sometimes just once a month in the winter. When I start noticing that “doggy smell” it’s time for a bath. 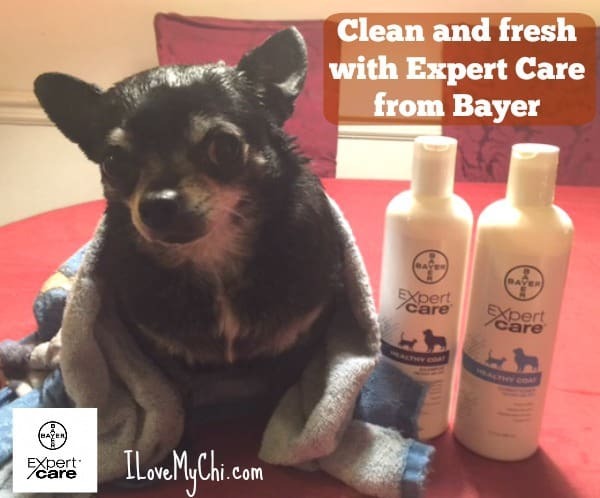 Lately we have been using shampoo and conditioner from the ExpertCare™ line at Bayer®. They actually have a moisturizing formula and I think we will switch to that during the dry winter months but right now we are using the Healthy Coat formula. I love the mild smell and how soft Kilo’s coat is after her bath. You can find the ExpertCare line at PetSmart (check their Health and Wellness Aisle) or at their online store. 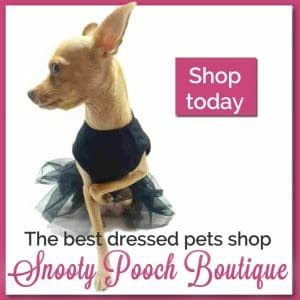 They specialize in quality skin care for dogs (and cats too!). 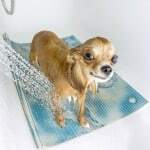 So how is bath time with your Chi for you? Have any tips you would like to share? And have you tried any of Bayer’s Expert Care products yet? Thanks! 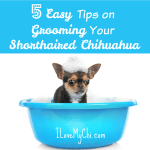 This is very helpful especially you’re a groomer. You know what are the tips that are good for our loyal friend. Glad to found your blog.